Ma maison en bord de mer est niché dans quatre acres de érable, le bouleau et l'épinette bois sur les rives sud accidentés de la Nouvelle-Écosse, donnant sur l'océan Atlantique. Juste une courte distance en voiture de Halifax, la maison est très accueillante et chaque chambre dispose d'une perspective différente sur les environs, en ajoutant le dynamisme et l'intérêt de votre plaisir d'espace de vie. Façades principales face à l'évolution des points de vue saisonniers Sud et l'Ouest, en maximisant la puissance du soleil et. Couchers de soleil avec des couleurs riches et magnifiques uniques. Les grandes fenêtres et les portes en verre abondent, rendant la maison très lumineuse, et l'esprit de levage. Érable et planchers de cerisier brésilien. Portes pleines cerisier américain pour toutes les pièces intérieures. Un étage principal de concept ouvert, centré autour d'une grande cuisine entièrement équipée, avec bar. Une salle à manger pouvant accueillir confortablement huit, donnant sur la forêt et l'océan. Un salon / grande salle avec une banque de deux étages de fenêtres, donnant sur l'océan. Une cheminée moderne, offrant un point focal, et de la chaleur naturelle pour les jours froids et humides. Une mezzanine, donnant sur l'étage principal fenêtres à deux étages et une cheminée principale. Une deuxième série de confortables canapés en cuir dans le salon, avec télévision et stéréo. Deux énormes chambres de chaque côté de la zone de vie de la mezzanine, chacune avec leur propre salle de bain complète. La chambre principale dispose d'une double baignoire profonde tandis que la deuxième chambre dispose d'un spa de qualité, luxueux douche de plain-pied. Confidentialité totale de chambre - Les chambres supérieures sont aux extrémités opposées de la maison, et bien loin de la chambre à coucher à l'étage principal. Mots-clés: Retraite exécutif en bord de mer, la sérénité, la plage, privée, isolée, bois, voile, kayak, confortable, nature, océan, réunion de famille, calme, reposant. 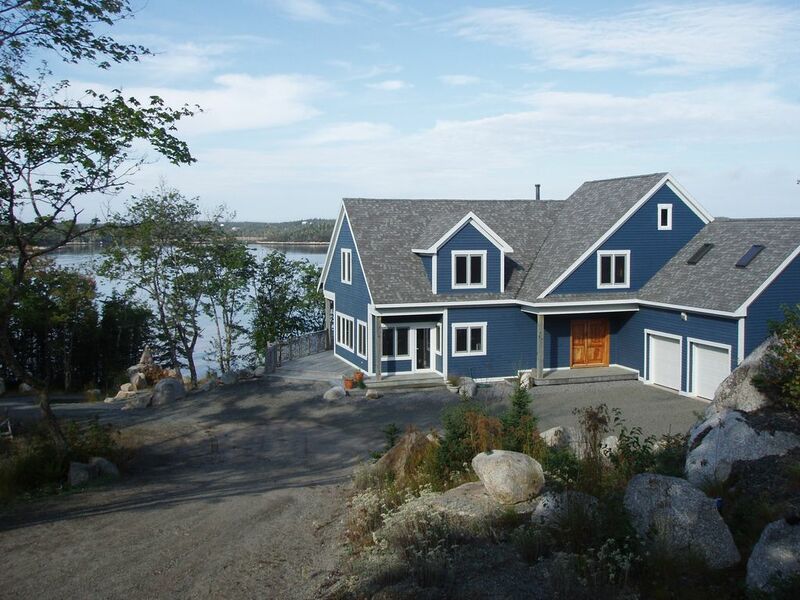 This is a beautiful house with breathtaking views of Blind Bay. We had a wonderful stay! The house itself is lovely and very well-equipped. The location provides a lot of privacy. The sunsets are spectacular! We enjoyed visiting Halifax as well as many small communities in the area. Bill was incredibly helpful before and during our stay. He answered many questions and gave us great suggestions of restaurants we might enjoy. The flowers, wine and chocolate were very much appreciated. We highly recommend this property! The house is perfect in every detail. We enjoyed everything about the place, but we especially liked sitting on the deck listening to the loons in the morning and watching the amazing sunsets in the evening. We thank Bill for his suggestions regarding places to visit, farm stands, and restaurants. Stunning views from a beautiful home in a convenient location. The daily observation of the seals in the bay and sleeping on the island off shore was very special. We really enjoyed our stay in this beautiful home. The interior pictures do not do it justice. A very well-stocked kitchen (with sharp knives! a VRBO rarity) with an eating area with gorgeous views out the wall to wall windows, comfortable beds, two very comfortable sitting areas with more than adequate super comfy seating for four, a lovely deck for your morning coffee, all with fantastic views of the bay from almost every window. It was spotlessly clean, as well. The weather did not really cooperate with us for a fire at the firepit right at the water's edge, which was a shame. Bill was very easy to deal with booking-wise, and was there to meet us and show us around at arrival. We had one question about something during our stay, and Bill answered our text immediately. You are a 20 to 30 minute drive from Halifax, but that wasn't a negative for us. It is such a peaceful location, and lovely stargazing away from the city lights. I can recommend the property without hesitation. We had a wonderful time and the home is beautiful and flawless. Bill is a gentlemen, a professional, and an all around great person. This was our first visit to Nova Scotia from the states. What a magical place and what friendly and fantastic people? I hope to return to Nova Scotia and would not even look for another place to stay other than this property. Why mess with success. Thanks Bill and we wish you the best. For our first trip to Nova Scotia, we couldn’t of asked for a more serene and comfortable place to stay! With Bill graciously greeting us upon our arrival, and showing us around his home was a great way to start, along with the lovely flowers, chocolates and wine that was left to welcome us! The home has everything you need and the setting is wonderfully quiet and beautiful, with spectacular sunsets enjoyed from the deck overlooking the bay and the occasional seal popping up to say hello! It was a good location to start to enjoy such day trips as Halifax, Peggy’s Cove, Mahone Bay, Lunenburg and Kejimkujic National Seashore. My only regret is one week is not long enough! If we ever have the opportunity to come back to Nova Scotia, we would definitely love to return to Bill’s home! I highly recommend staying here! Rates for extended stays available upon request.